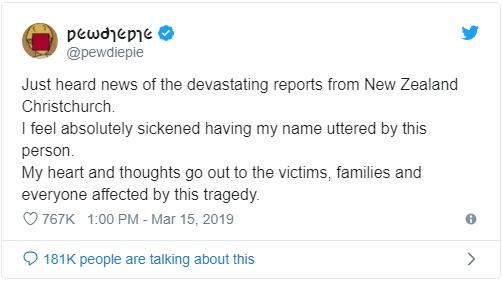 Over 65,000 sign petition to remove PewDiePie from YouTube.PewDiePie, real name Felix Arvid Ulf Kjellberg, is a YouTube celebrity who has 92,883,171 subs at the moment. But from her words, we can see she’s not just going after PewDiePie, she also targets YouTube: “At what point is YouTube legally responsible for the content it provides and allows on its platform? I believe that his actions constitute a clear and present danger to society. YouTube’s guidelines state, “if content is intended to be humorous or satirical, it may remain online, “even if offensive or in poor taste.” However, “if the uploader’s intent is to incite violence or hatred, it will be removed.” How long will YouTube remain negligent? PewDiePie is currently in hot competition with Indian company T-Series to be the most subscribed channel on YouTube. Earlier, PewDiePie released a congratulations parody video for T-Series! The video definitely pushed him to get the first place more stable. Do you agree with the petition? Do you think YouTube should remove PewDiePie from YouTube? Prev Does YouTube Really Take Down Toxic Videos on the Platform?